"Spicy and smoky beef brisket. My version has no BBQ sauce added. Keep the dish tightly covered during cooking and don't peek. This prevents the brisket from drying out. If you use a larger or smaller brisket, adjust the cooking time to 1 hour per pound. 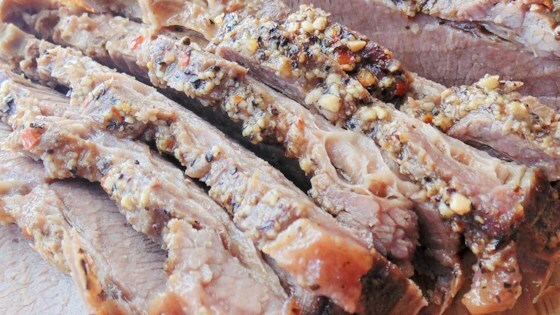 Cut the brisket against the grain with a sharp knife, or it will be stringy." Place the brisket in a glass baking dish, fatty-side down. Mix Montreal steak seasoning and red pepper flakes together in a small bowl; rub over the brisket firmly to press into the meat. Flip the brisket and continue seasoning the fatty side. Stir beef stock, lemon juice, and liquid smoke together in the bowl; drizzle over the seasoned brisket. Cover the baking dish tightly with aluminum foil. Roast in the preheated oven to your desired degree of doneness, or an internal temperature of 145 degrees F (65 degrees C) for medium, about 5 hours. Remove from the oven, cover with a doubled sheet of aluminum foil, and allow to rest in a warm area 10 to 15 minutes before slicing. I screwed it up somehow. My brisket was 2.5 lb and t was well done at the 2 hr mark. Luckily I checked it. It was already at 200* internally. A little warmer than I would have liked, but did not take away from the taste. I over cooked it a little. I suggest checking temp every hour after about three hours. Super easy and very tasty. Served with mashed potatoes and salad, this made for an excellent meal. Thanks for sharing.